Bund futures are complicated by their contract design which stipulates physical delivery by the Short for each futures contract of €100,000 face value from a choice of deliverable bonds. Conversion factors exist to compensate for a bond being delivered with a coupon other than the 6% also specified in the contract design. This process involves the Long paying the Bund EDSP x the conversion factor + Accrued Interest on the delivery date on the bond being delivered and gives rise to cheapest-to-deliver optionality, when the yield curve is anything but 6%. The theoretical value of the Bund future should be the forward value on the delivery date of the cheapest to deliver in the basket of deliverable bonds, divided by the conversion factor. Unfortunately, that’s not the end of the story, rather the start. If you were to price a bund future using the above formula you would find it was higher than the actual market price of the future. This is the net basis (when multiplied by the conversion factor) and reflects all that embedded optionality mentioned above. The optionality exists because the cheapest to deliver bond underlying the bond future can change plus there are additional sources of optionality; namely switch and wildcard optionality, which are specific to the actual delivery process. All the above are known knowns and have been for over two decades. Consequently, that means that the embedded optionality in bund futures is pretty fairly quantified by the market, leaving things like bund rolls being driven by more mundane things like supply and demand and financing considerations. Bund rolls are the effect on the calendar spread of the rolling process of open positions in the front month into the back month to maintain directional bias. The chart shows the effects of the Z3H4 roll. 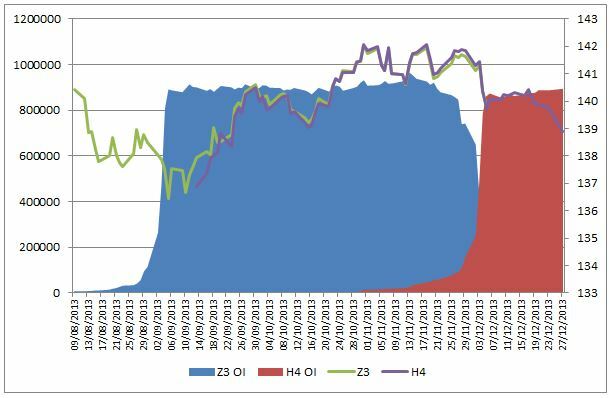 The blue and red shading is open interest for Z3 and H4 respectively (left axis) and the Z3 and H4 prices are prices on the right axis. It can be seen that the open interest in Z3 coincides with a rally in Z3 bund prices and so it could be inferred the trend following traders, (systematic hedge funds like MAN, Winton and Bluetrend plus CTA’s) are long and might want to maintain the positions into H4. This means at some stage they will have to sell their Z3 holdings and buy H4 futures. This would cause a spread cheapening or narrowing. The window for trading the roll is quite narrow since it can be seen that the H4 doesn’t come to life in trading volume or OI until early November 2013, and doesn’t really pick up until end of November. This means that there is only about two weeks in which to actively trade the roll but the trader could have actively positioned expecting a roll of long interest by selling the Z3H4 spread. 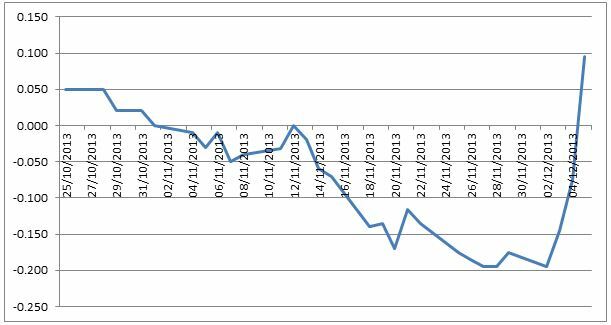 The following chart shows that the Z3H4 spread could have been sold in early November for around zero and subsequently fell about 15 ticks by early December. Only in the last days did the spread widen dramatically. Bund rolls are amazingly complex driven by a multiple of factors. Relative value of each futures contract to the basket of underlying deliverable bonds. Directional bias of open interest. Often it is changes in repo rates that can cause volatility in the final days approaching the last trading day of 6th December. Bunds that are cheapest to deliver can often trade special, sometimes at negative repo rates which can make the futures contracts drop. That might have happened here to the H4 relative to the Z3. This entry was tagged bond future rolls, bund rolls, calendar spreads, cheapest to deliver, net basis. Bookmark the permalink. The demise of stir futures?